These days it seems everybody is tinkering with their own IoT project, I am no different. It started almost two years ago when I, while looking to build RF nodes, stumbled across the blogs of Nathan Chantrell, Martin Harizanov, Jean-Claude Wippler and Felix Rusu. These guys had built exactly what I was looking for and Nathan even offered the gerbers needed to order Tiny328 PCBs. 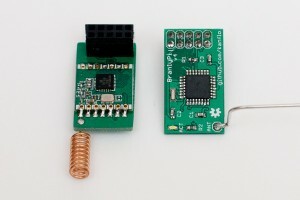 Tiny328 is an Arduino based RF node fitted with the RFM69C ISM radio. My experience with soldering was limited and my experience with designing PCBs was none, I am a software guy after all. It turned out that reflow soldering PCBs with 0603 components in a hot plate is quite easy (and fun!) once you get the hang of it. Google is your friend. My fist baby steps in designing PCBs was an Arduino based modem with the RFP69 radio and though hole components, the BranlyPi v2 (v1 was without an external oscillator which caused the ATMega’s buadrate to be off leaving the modem and the RaspberryPi unable to talk). BranlyPi v2 with through hole components. BranlyPi v4 with SMT components, testing antennas. BranlyPi v4, where it belongs. It was superseeded by the v4 (don’t ask about the v3) which was surface mounted components all the way. Schematics and gerbers are here if you want to build your own. With all that hardware available it was time to write some software and make two Tiny328s talk. The “hello world” was LowPowerLab‘s “Struct send” and “Struct receive” examples. I soon attached a DS18B20 temperature probe to one of the nodes for some more fun (sic!) data. 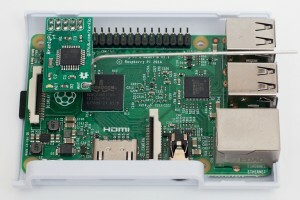 Software for the BranlyPi was written as well as a python script running on the RaspberryPi listening to the BranlyPi modem. A node fills in data into a struct holding a type field. The types can be “temperature”, “battery voltage measurement” and so on. 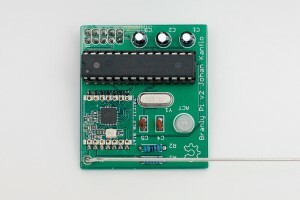 The struct is transmitted to the BranlyPi modem. The BranlyPi modem receives the struct and formats in into a textual representation that is sent to the RaspberryPi over UART, eg. The gateway script on the RaspberryPi reads the line above from the UART and posts it to a local Emoncms installation. The node was placed in my garage with the probe outside. I had (sort of) built my own RF thermometer. Cool! An identical node (with a different node id 🙂 was built and placed indoor. Next, how about building one of those moisture measuring plant nodes? Or one that could tell me if I had forgotten to turn off the lights in the garage at night? I had a feeling the RF network would grow. So far all is well from a technical point of view. The current software architecture would however need a complete rewrite to be useful, more of that later. Source code and hardware docs on Github. “Branly” you might ask? Édouard Branly was one of the early pioneers in wireless telegraphy.